The Pepperdine administration is continuing to work with student leaders to revise the Good Samaritan policy. Dean of Students Mark Davis was clear that conversations regarding the revisions of the policy are independent of any particular incidents. The policy has been widely debated among students since last fall, after an off-campus party involving members of the Delta Tau Delta fraternity. Pepperdine administration, including Davis, and the Student Government Association (SGA) are considering student voices, various past incidents and other universities’ systems to better clarify and revise the policy. Davis said the goal is to finalize all revisions by the upcoming summer so that the new Good Samaritan policy will be complete in time for New Student Orientation (NSO) in the fall. These violations are outlined to include “crisis situations involving alcohol, drugs, physical violence and/or sexual misconduct.” Further information can be found on the online Good Samaritan policy FAQ page. In most cases when a violation of the Code of Conduct occurs, the process is fairly simple. All incident reports involving Good Samaritan go to Sharon Beard, associate dean of Student Affairs. A meeting is then set up between the student in question and Beard where they can discuss the incident and talk about moving forward. Beard said that in a majority of cases, the student receives immunity under Good Samaritan without any complications. There have been 29 cases in the past three years that students received full immunity under the Good Samaritan policy, Beard said. “No one talks about it when the policy applies, but others seem to come forward when it doesn’t apply,” Beard said. In the infrequent circumstances where the details of the incident make it unclear whether the Good Samaritan policy applies, Beard said the issue is taken to a hearing in front of the Student Disciplinary Committee, where the student is able to make their case for immunity. “It is cases that are not so black and white, which cause us to relook at the policy and see where there can be revisions,” Beard said. Current SGA president Austin Welch said he is scheduling weekly meetings with Beard, Davis and a small group of other SGA members to rework the policy. Welch sent out an email to the student body Monday afternoon requesting feedback and opinions regarding the Good Samaritan policy. Students can take a survey enabling them to express their experiences, feelings and knowledge regarding the policy in a private, anonymous setting. In addition, Greek life representatives are submitting their perspectives and ideas in the revision process. Welch said fraternity and sorority leadership have reached out to him and administrators, voicing their particular concerns with the policy. “Greek life on campus has had collective meetings and collaborations on suggestions that they have made,” Welch said. Welch has taken steps in hearing the voices within several student groups. 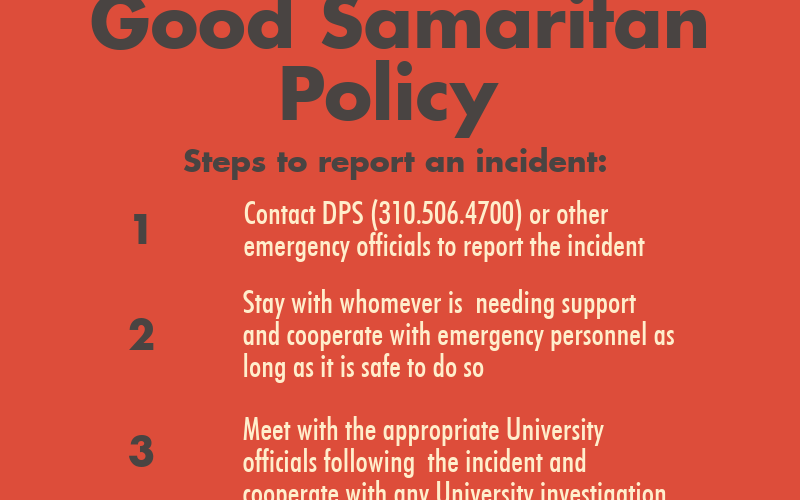 “I have been reaching out to other organizations on campus and asking what their experience with using the Good Samaritan policy is, whether in their organization or personally,” Welch said. Although no aspects of the new policy are finalized, the administration is attempting to determine clearer language regarding specific scenarios and issues. Davis and Beard said a big consideration in an unclear Good Samaritan policy situation is whether or not the good samaritan student was also a major perpetrator of the student’s harm. Beard noted that, in a crisis situation involving alcohol for example, there is a big difference between merely providing access to alcohol and forcefully pressuring someone to drink alcohol. Administration is taking distinctions such as this into careful consideration in the revision process, so the policy can be altered to include clearer language. 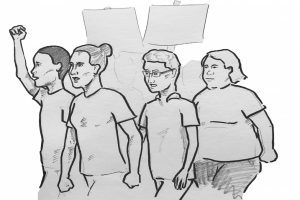 Administrators and students will discuss how or if the policy will apply to student organizations in the future. Davis said the Good Samaritan policy’s immunity currently only can be applied to individual students and does not claim to cover student organization penalties. Language establishing what number of students constitutes an official organization event would be important in this discussion. Beard said she played a part in creating the policy that states an organization may be held collectively responsible for violating the Code of Conduct when four or more members were present at the event in question. Beard emphasized that the policy states “may be” because there are other factors considered. The follow-up after requesting the Good Samaritan is the third area Davis said they were possibly clarifying. Davis and Beard said, currently, repeatedly lying to administration about code violations effects the application of Good Samaritan immunity. Beard emphasized the goal is not to “get the student on a technicality,” but continuous dishonesty prevents administration from understanding the scope of the issue and ensuring the safety of all students involved.